We’d love your help. Let us know what’s wrong with this preview of The Test of My Life by Yuvraj Singh. To ask other readers questions about The Test of My Life, please sign up. There'll be three kinds of readers of this book. Cricket fans, cancer survivors/patients, and those who love reading memoirs. It's a sincere book - honest and heartfelt, and while the editing may be sloppy and lenient, it didn't bother too much because it felt like it was Yuvi indeed who was talking. And one would expect a cricketer to narrate his story in simple words, without trying to impress me with wordplay. The book did strike an emotional cord with me. Yuvi, after all, is a cricketer of my There'll be three kinds of readers of this book. Cricket fans, cancer survivors/patients, and those who love reading memoirs. It's a sincere book - honest and heartfelt, and while the editing may be sloppy and lenient, it didn't bother too much because it felt like it was Yuvi indeed who was talking. And one would expect a cricketer to narrate his story in simple words, without trying to impress me with wordplay. The book did strike an emotional cord with me. Yuvi, after all, is a cricketer of my generation (as is Sachin, Sourav, Rahul...) and if, like me, you've enjoyed and cheered for him every time his match-winning knocks steered India to victory, then you'll like hearing this story. The repetitive detailing of his chemo sessions got a bit boring at times, but I can imagine several readers (who've seen or been with people experiencing chemotherapy) nodding their heads as they flip through those pages. The Test of My Life is meant to inspire, help us battle all the odds, and that's something it does handsomely. Most importantly, it helps us get a peek into the mind of a cricketer in his own words, without any adulteration from the press. When I started reading it, I thought it will have a lot of cricket and a lot of cancer survival stuff and it might not be that interesting. But the innocence with which the book is written is lovely. The inspirational stuff is not overloaded with heavy phrases or anything. It is simply a story of survival. It is a must read for any cricket lover or Yuvraj fan. But for all others, this book might feel full of time jumps, repetitions and grammatical errors. A good editing might have made it a wonderful book. No doubt "if you can we can" by Yuvraj Singh. An inspirational story has been written by this Punjabi guy who has scribbled his journey from Kid to a cancer patient survivor and again back to his passion i.e. Cricket. In his debut book, Yuvraj is able to knock our mind and make us to think " If we are passionate, can't we face the challenges, which are thrown to our way." A perfect story and must read story. Hats of this guy who didn't give up till end and made his way to his game. Full marks. You are a true legend and sets an example for youths about how to fight back from a serious issue. Very inspiring! Must read for any sportsperson and/or cancer affected!! Written from the heart in pure,simple words!! This book is really very good in looking more closely into a sportsman life. It gives us the idea of the amount of pressure generated on the players during the game. In a game like cricket which is played and watched with so much passion in INDIA, it gives a greater amount of responsibility on the shoulders of the players where some of the players like Sachin Tendulkar are seen as GOD of cricket and literally worshiped by the crowd. The book also very well described the very state of mind of a per This book is really very good in looking more closely into a sportsman life. 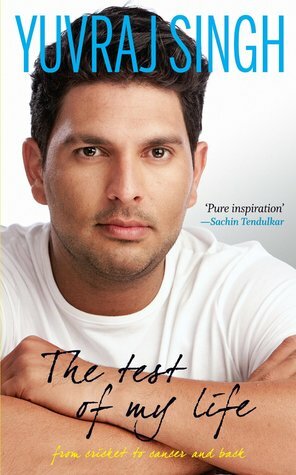 The Test of My Life is a real life story based on Yuvraj Singh's struggle through cancer and back to life. The book tells how Yuvi became a cricketer and how he grew up as a human being throughout this journey. Very simply written which gives a feeling that you are hearing the story from Yuvi's mouth itself. This book would be an inspiration for upcoming cricketers as well as cancer survivors. It gives hope to those who struggle through difficulties of life. You feel bad when the details of Yuvi The Test of My Life is a real life story based on Yuvraj Singh's struggle through cancer and back to life. The book tells how Yuvi became a cricketer and how he grew up as a human being throughout this journey. You feel bad when the details of Yuvi's chemotherapy is recited in such depth and he explains the agony he went through during those times. Being a cricket fan myself, I was well aware of Yuvi's illness but reading the book firsthand literally brought tears to my eyes. Never read such genuine description. Initially it excited me, then it showed the depressing side of sports and ended with the battle with Cancer. In the end I was wondering if Yuvi had been a normal person would such turnaround in small time be possible. When I see Yuvi's batting in T20 today, I am reminded of all the fights he battled and his comeback. My Grandfather had cancer and he couldn't make it. I wish he had survived the intense pain and radiation sessions. I actually ended up a bit dep Never read such genuine description. Initially it excited me, then it showed the depressing side of sports and ended with the battle with Cancer. In the end I was wondering if Yuvi had been a normal person would such turnaround in small time be possible. This is an honest book, written when he was going through a tough time. People who are in the same situation will be able to relate to it better. It is definitely not a literary read....but is an honest attempt to record the pain and suffering. Only wish the editor could have been more careful of the jumps in the story...spelling mistakes and bad grammar! We can know the actual thought process and mental state of someone suffering from cancer. Yuvraj had been such a great character and such a wonderful player over years for India. This story is pure inspiration.
" If Yuvi can, you we can." Also, it takes us back to the time in 2011 where men in blue finally lifted the world cup after 28 years! Recommended for cricket fans / cancer patients and for people seeking inspirational reads. Reading fiction and non-fiction are two different things. While reading fiction, you end up being in a world of imaginations but while reading a non-fiction attempt, you know that these things can specifically happen with you. Hence you read it with more determination and pleasure. There'll be three kinds of readers of this book. Cricket fans, cancer survivors/patients, and those who love reading memoirs. It's a sincere book - honest and heartfelt. When I started reading it, I thought it will have Reading fiction and non-fiction are two different things. While reading fiction, you end up being in a world of imaginations but while reading a non-fiction attempt, you know that these things can specifically happen with you. Hence you read it with more determination and pleasure. When I started reading it, I thought it will have a lot of cricket and a lot of cancer survival stuff and it might not be that interesting. But the innocence with which the book is written is lovely. This is purely an inspirational story to read. It is simply a story of survival. It is a must read for any cricket lover or Yuvraj fan. Such a simple book. It's all C's in his life, cricket, cancer, cup and chemo, it ll move you to tears when he describe his agonies during 2011 World Cup and US treatment days! You get your happy tears later when he describe his emotions for Chennai crowd cheers in his come back match after chemo. An inspirational story has been written by this Punjabi guy who has scribbled his journey from Kid to a cancer patient survivor and again back to his passion i.e. Cricket. This is an honest book, written when he was going through a tough time. The story teaches us that one needs to get out of his comfort zone in order to achieve something. The story tells us about the hidden story of Yuvraj during the world cup. A book displaying a variety of emotions- perseverance, pain,fear,aggression and a lot more. What holds this book together is though the way Yuvraj describes his killer instinct to fight cancer, the details around chemo treatment The book offers a glimpse into the journey of a top class sportsman and the ordeals faced with injuries/illness. The authors provide an insight into the ambitions, highs and lows in the life of Yuvraj Singh. The problem with the book is there is way too much description of particular cricket matches which gets redundant at times for someone watched that matches. # Next to Lance Armstrong's, ' Its not about the bike', Yuvraj singh displays emphathatic physical and emotional greulling which a person undergoes while receiving chemotherapy. Cancer rules the emotional and spiritual domain of entire family; which often leaves permanent psychological scar which accompanies this monster.Not all patients alas have curable malignancy and means to receive customised therapy with Dr. Einhorn ( who gave cisplatin and made germ cell tumor curable to 95% from mere 5%) # Next to Lance Armstrong's, ' Its not about the bike', Yuvraj singh displays emphathatic physical and emotional greulling which a person undergoes while receiving chemotherapy. Cancer rules the emotional and spiritual domain of entire family; which often leaves permanent psychological scar which accompanies this monster.Not all patients alas have curable malignancy and means to receive customised therapy with Dr. Einhorn ( who gave cisplatin and made germ cell tumor curable to 95% from mere 5%) at Indianapolis, but its wise to spare a thought for millions of cancer patients who are currently facing this demon with equally incapcitating trio of surgery, radiotherapy and chemotherapy. An Honest Memoir by Yuvraj Singh about his journey from the heights of World Cup victory to fighting Cancer and Back. He pens down his feelings while battling cancer with great details.Really,admired the simplicity with which the book’s been written,I read it as if I was hearing every single line in Yuvraj’s voice.This also means that grammartical errors are aplenty but who cares! Two kinds of people,must read it.One,the Cancer patients/survivors and their close ones.The book shall inspire you. And An Honest Memoir by Yuvraj Singh about his journey from the heights of World Cup victory to fighting Cancer and Back. Reading fiction and non-fiction are two different things. While reading fiction, you end up being in a world of imaginations but while reading a non-fiction attempt, you know that these things can specifically happen with you. Hence you read it with more determination and pleasure. You know that you can end up being a protagonist or experience the same events as mentioned in the book. I am just sitting after completing 4 hours read of Yuvraj Singh, the cricketer's autobiographical attempt where Reading fiction and non-fiction are two different things. While reading fiction, you end up being in a world of imaginations but while reading a non-fiction attempt, you know that these things can specifically happen with you. Hence you read it with more determination and pleasure. You know that you can end up being a protagonist or experience the same events as mentioned in the book. I am just sitting after completing 4 hours read of Yuvraj Singh, the cricketer's autobiographical attempt where he tells us about his journey from Cricket to Cancer and how he fought the disease and ended up being a normal Cricketer again. The book is titled perfectly "The Test Of My Life" and has a tagline "from cricket to cancer and back". The cover page carries a very good image clicked of Yuvraj Singh with his shining eyes, black hairs, glowing face and an expressive positive attitude. It also has Sachin Tendulkar's reaction on the book "Pure Inspiration" imbibed on it. On the back cover, the reactions of Kevin Pietersen, Virat Kohli, Rahul Dravid, Harbhajan Singh and Saina Nehwal is mentioned. There's nothing over the shell of the book that can stop you from purchasing it except the MRP of the book which is 400+. But... Yuvraj's attempt and will power to let everyone know his story and life regarding cancer is something for which he needs to be applauded. The whole description of 2003 World Cup and then our epic 2011 World Cup including the Finale gave me goosebumps. His description about how he was struggling with his body but still working for the World Cup made me emotional too. Why a World Cup tournament is so important for a Cricketer is also explained by Yuvraj. He has shown his emotions for Indians who support Cricketers and make them feel good about themselves. He has also said about how media has manipulated the news and sometimes analyzed things by themselves and wrote and talked about him. This tells us how cruel media is sometimes. But he has also thanked media for the love that they gave him when his news of Cancer initially broke out. Later on his description about how his mother and he dealt with Cancer is something that will always remain with me. He has wonderfully shown how much a cancer patient has to suffer and what emotions he/she goes through. Even I am scared of this disease now. But as Yuvraj Singh has himself come out of it after losing all the confidence and will power also gives me an inspiration that even I can beat Cancer if I ever fall in this condition. Also the training that he went through after the chemotherapy gives a good insight about what a passion of living and doing what one loves the most can make one do. One fails to give up in such situations. In all, I would say that Yuvraj Singh will become a sibling to everyone whoever will read this book. He is the first in the contemporary Indian team to write a book himself. But I would still say that Lance Armstrong's book and Brett Lee's autobiography was more liked by me than this. But as such books should not be judged, I am not rating this one. I would just ask all to read it as it surely gives energy and makes us emotional for numerous times. :-) And Yuvraj, Kudos and Respect!!! The strength one requires to fight cancer is a lot, more than I can even imagine. We have heard a lot about cancer and the difficulties that come with it. But by reading Yuvraj's story, I think I got a glimpse of how difficult and challenging this fight must be. Something quite unimaginable otherwise. This book represents Yuvraj Singh fight against cancer and how he came back. One of the ever interesting book to read, how a cricketer goes through when the things are not in favor. Along with this many incidents related with his father, family and other cricketing aspects are indicated. No doubt his journey to get recover and fight against the odd circumstances are the main emphasis. A simple, sweet book. I'm sure that everyone would've loved a bit more cricketing insights from him, but I get that the book is not about cricket but about cancer. Power to Yuvi, and I really hope that he writes a more detailed book in the future! I could closely identify with the struggles. A very well written and well chronicled book. Loved reading it. Read it to understand the struggles, the pain, the small victories and the defeats that make the life of patients and survivors a trial by chemo. Perhaps it was me general aversion to non-fiction, my hatred for ghost-written books or simply because I couldn't care less about cricket, this book failed to excite me. The cancer plot was interesting, but that's about it. Truly inspirational story of survival. Beautifully written piece of work. The struggle was real for Yuvi. But, in the end, the tiger prevailed.